Obnoxious Golf Shirts: One of those professional sports that don’t mandate its athletes to adorn a uniform is golf. This gives golfers the opportunity to show off their fashion sense. The first thing that comes to most people’s mind when you think of golf shirts is conservative and boring designs. Now, there has been an alternative to this as many apparel designers are churning out high energy designs that are attention-grabbing and composed of bright colors. This development has excited a lot of fashion-forward golfers as these extreme golf shirts avail them the opportunity to ditch boring golf shirts for something different and out of the ordinary. 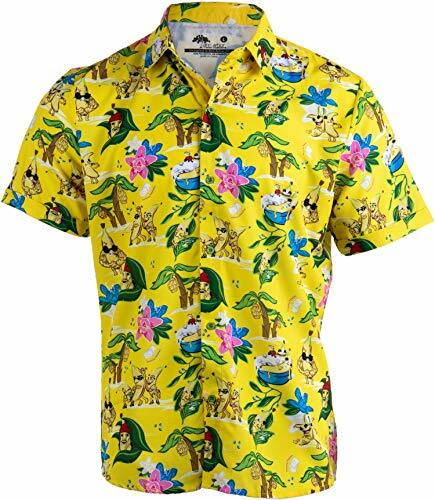 Here are top 12 obnoxious golf shirts that look tacky with bright colors so you can look stylish and comfortable at the same time. 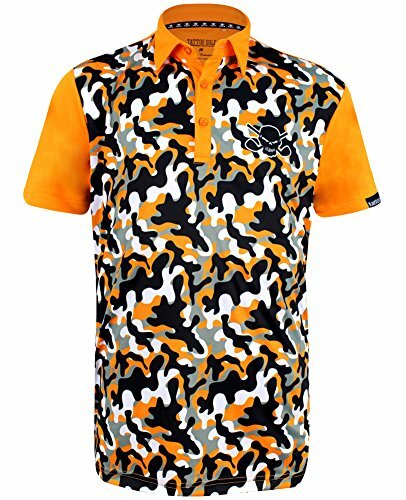 With this first obnoxious golf shirt, you can stand out in the crowd without being dressed outlandishly. This golf shirt brings a sense of beauty, comfort, and ‘swag’ to your appearance. The lightweight design and dri-fit material of this shirt can take you anywhere you choose to wear it to the clubhouse, golf course, or a night with friends out of the town. To enhance comfort, this shirt features a moisture-wicking material that helps to transfer perspiration and heat by controlling the movement of water from the skin surface through the fabric for faster evaporation. The Tattoo Skull might attract some attention, but that is fine because you know a little envy goes a long way. This next golf shirt features a bright, colorful design for stylish golfers of every level. It is an eye-catching and a bold option for those fashion-forward golfers who want to separate themselves among the rest. It has lots of comfortable features that will surely enhance the wearer’s game. It is 100% polyester and has an even-hem bottom with tailored side vents. The micro-mesh knit body of this shirt helps with moisture management. The generous fit of this shirt helps to accommodate most beer bellies. Other features include UV protection, a tagless neck label, solid rib-knit collar, hemmed sleeves among many others. This men’s obnoxious golf shirt combines horizontal stripes with unique patterns and designs to make it stand out. It features a ProCool fabric technology that ensures complete flexibility and comfort throughout your stay on the golf course. This shirt allows for natural air circulation for superior moisture control. The ProCool fabric technology helps to move moisture away from your skin so you can stay cool and dry all day long. It is 100% polyester, and the back and sleeves feature full sublimation striped design. It is available in different sizes from small to 4X-large. This shirt fits true to size, washes well, and has a soft feel. 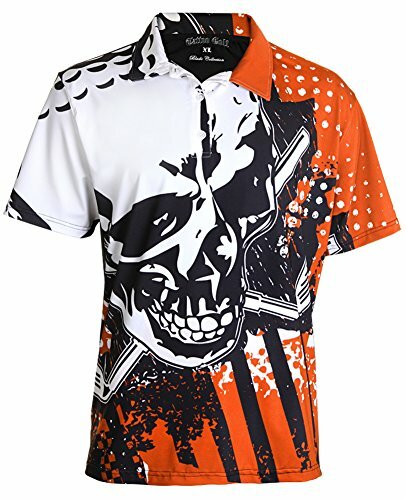 This is another innovative and tacky golf shirt design from TattooGolf. The classic argyle design and wild graphics of this shirt will definitely catch the attention of those far and near. 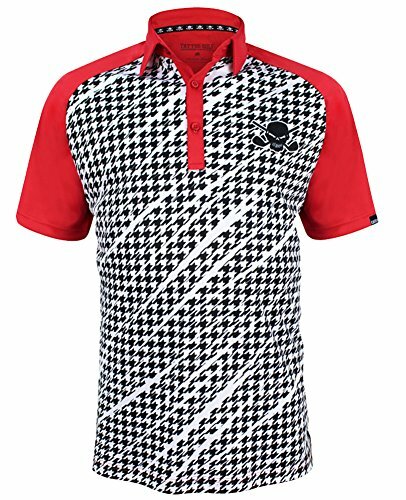 Just like the Houndstooth design this also features a ProCool breathable material that ensures a superior moisture control. It is comfortable, flexible, and it can keep you cool and dry throughout the day. This shirt is available in different colors and sizes to suit your preferences. 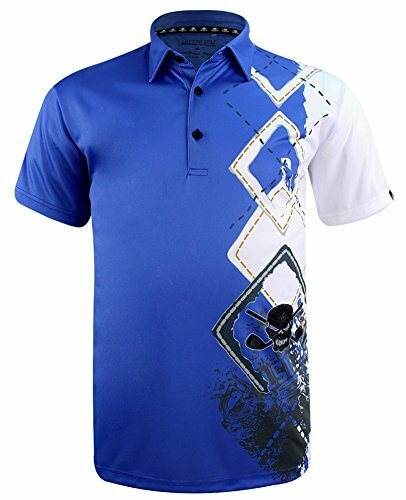 This is a relatively inexpensive stylish tacky men’s golf shirt that is available in whopping 37 different colors! It is made from breathable polyester material, and it is comfortable to wear on a golf course or a casual occasion. The reinforced double-stitching on all seams on this shirt makes it unique. It is machine washable; it doesn’t fade, and it dries quickly. 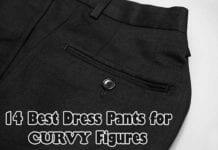 This shirt is a slim fit cut, and it is available in different sizes. 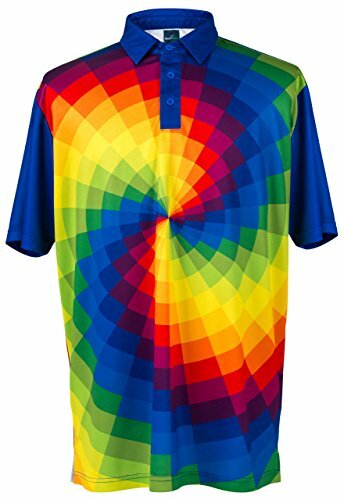 The next goofy golf shirt is a colorful alternative to the boring golf apparel most golfers wear. This shirt is only for the bold, and it can help you exude confidence when you are playing the beautiful game of golf. 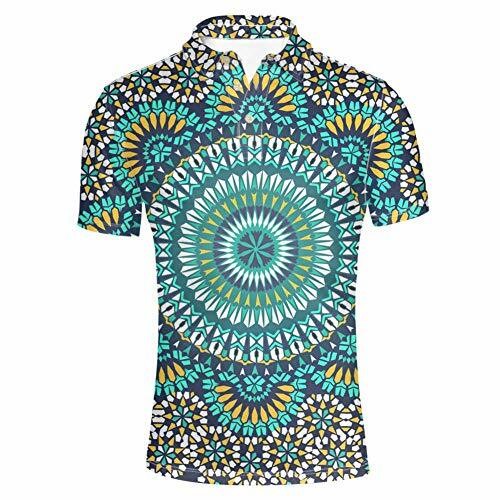 This shirt can help to add a splash of color to go anywhere, and it can even brighten up someone’s day with its eclectic mix of colors. Just like the Retro, this is also available in 37 different colors. 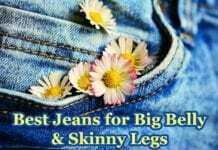 It has breathable material, and it is machine washable. 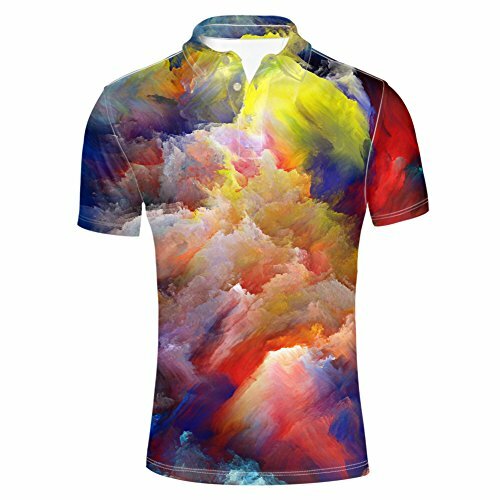 This is another fun colorful men’s extreme golf shirt from HUGS IDEA. It is available in 27 abstract patterns and in different sizes. It is made from top quality breathable polyester fabric you can wear them on a golf course or a casual night out with friends and family. The reinforced double stitching on all seams of this shirt makes it a durable option. It fits well, and it is comfortable to wear. The colors don’t fade after multiple washes, and you can wash in either with the machine or hand. 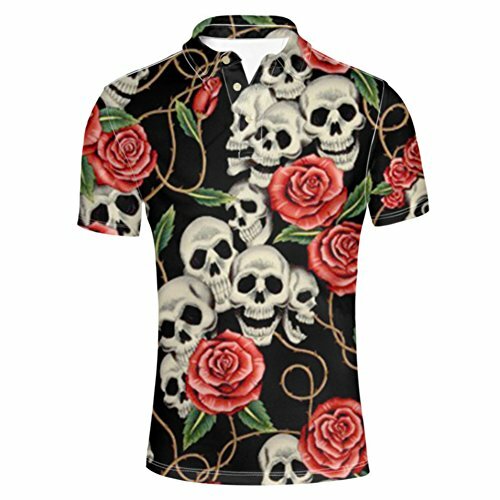 This wild golf shirt combines TattooGolf crossing clubs and iconic skull with camo prints for a unique design. Just like all other TattooGolf shirts on this list, this shirt also features a ProCool fabric technology that ensures comfort and flexibility for the wearer. It is available in orange, white, and yellow. It is made from a lightweight, breathable material that helps to keep you cool all day long. This is a classy, collared polo colorful golf shirt that is available in vibrant patterns. It is made from a lightweight slightly stretchy material that sits and flex in your shoulders. This is right apparel for the golf course, church, work picnic, wedding receptions, or anywhere else. This shirt has a fun design, and the cut and fit are true to size. This shirt will surely catch the attention of everyone wherever you may go. This next tacky golf shirt is made from 87% polyester and 13% squandex. The double-knit fiber and sweat-wicking technology help to provide ventilation to keep you comfortable and dry. This shirt can help to maintain your body temperature while also keeping you warm and dry. The polyester has antimicrobial properties, and it is lighter than cotton. The ruffled collar of this ready golf shirt helps to prevent curling of necklaces. It is available in small to XXL sizes and in 15 different colors. 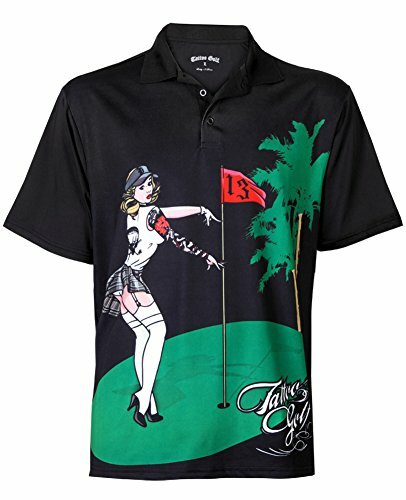 This is a high-performance men’s golf shirt that features a PinUp girl. The sublimation printing technique of this shirt gives it a silky-smooth feel. Its breathable and lightweight material ensures you stay dry and fresh for longer. It features a double arm, shoulder, and sleeve seams that makes it durable. It is available in different sizes from small to x-large. 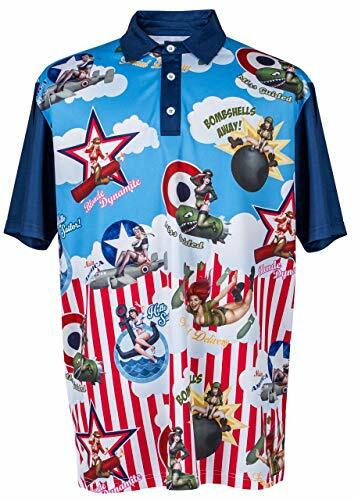 The last extreme golf shirt features different pin-up girls posing on bombs; an excellent way to show off your passion for golf and your ‘bombastic’ attitude. This shirt is undoubtedly for the fearless golfer in style and performance. It is made from 100% polyester and has a tagless neck label for comfort. The moisture management micro mesh will help to keep you cool and dry. This tacky shirt has a generous fit that can accommodate most beer bellies! As a golfer, your style on and off the pitch is a matter of self-expression and personal taste. You are more confident if you are comfortable in what you are wearing and a confident player is a dangerous one. 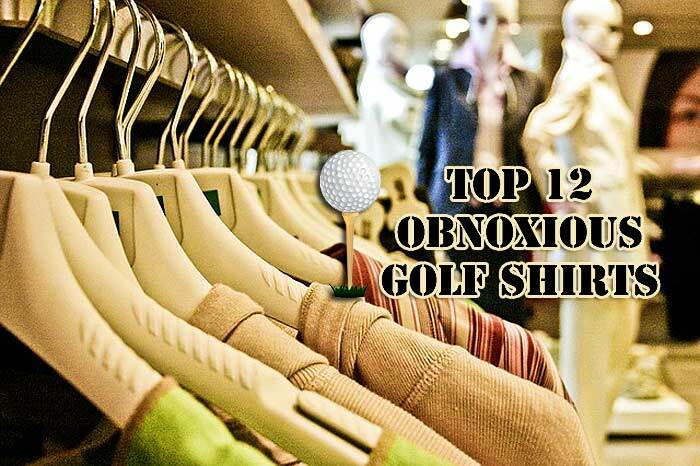 So, play good, look good, and feel good in any of these obnoxious golf shirts. All these obnoxious golf shirts we selected in this guide are all of the high quality and with a fresh and stylish design that will surely make you stand out among the pack without looking too busy or overwhelming.